Ensure that your recruiters, hiring managers and employees are aware of how to interview, manage, work and provide customer service to individuals with disabilities. 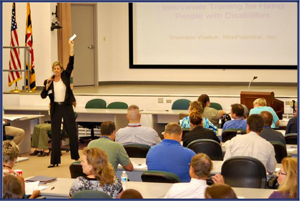 We customize our training program to give your staff the tools for successful integration of individuals and veterans with disabilities. Knowing how to communicate and work with this diverse population sets a successful foundation for compliance, empowers your business and your people. We develop an action plan and topics designed to meet your needs to engage and educate.